It's so confusing. I mean... I was a smidgeon of a tomboy growing up. I climbed trees and played tackle football with the neighborhood boys. (Oh my goodness!! Where were all of our parents?! It's a miracle I ever made it out of that neighborhood alive.) I delivered furniture during college and worked at a boys summer camp in the summers. I wore long socks and tennis shoes for YEARS of my life. As I mentioned earlier this week... I know very nearly nothing about being a girl. If anyone was going to have a house full of boys, it would be me, right?! As it turns out though, raising girls isn't as foreign as I thought it would be. My couch actually *IS* broken from too many flips over the back. (It probably didn't help that we put a trampoline behind it. But that's water under the bridge, right? It's way too late to be changing something like that now. There would be ANARCHY.) And the bins at the doors are completely full of muddy shoes of all sizes and colors. My oldest daughter plays more sports than my son. And we've already replaced TWO broken windows -- neither of which were caused by the one little boy. Except he's not so little. His voice sounds like a regular ol' boy child instead of an angel. And we haven't shipped marshmallows via the train track since he learned to do his own laundry. AND... he's growing out of all the adorable little boy cookie designs. And I'm not quite sure I'm ready for the UN-adorable designs of black-on-black angst. He's just going to have to settle for GRAY-on-black angst. I'm putting my foot down now. It's either that or we move the trampoline. 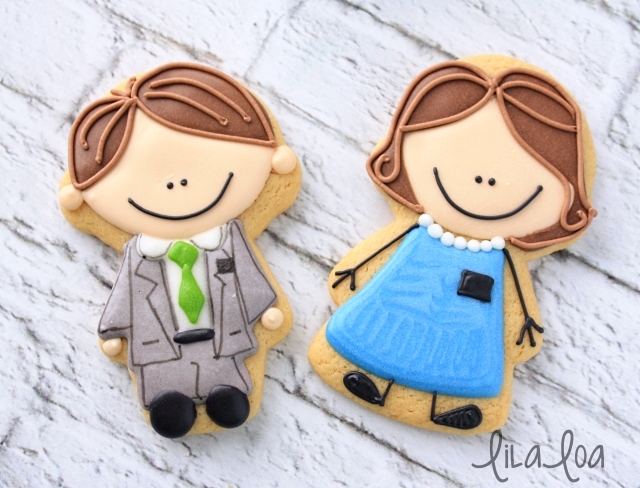 Anyway....these little man cookies just make me want to squish my own little man and pressure him into staying exactly the way he is for just a little while longer. It would probably just be easier to make the cookies though. 1. Before you ask - I got the cutter HERE. Use medium consistency skin tone icing to outline and fill the face area. Be sure to leave room for the hair. Let it dry for 15 minutes. 2. With medium consistency gray icing and a #2 tip, lay icing down everywhere the suit is going to be. Leave a space in the middle for the shirt and some room at the bottom for some shoes. Let it dry for a couple of hours. 3. Pipe the hair with medium consistency brown icing. Fill in the gap in the suit with white icing for the shirt. And pipe one black shoe with medium consistency black icing. Let everything dry for 15 minutes, or until the icing has formed a crust. 4. Add a second shoe with the black icing and pipe a tiny little stripe across the bottom of the shirt area for the belt. Add a little diamond for the tie know with medium consistency green icing and a #1.5 tip. Pipe a dot of skin tone icing at the end of each sleeve for the hands and on each side of the head for ears. Let that dry for another 15 minutes. 5. Use a black food color marker to outline the suit jacket and the pants. Don't forget the missionary name tag if you are making him a missionary. I also outlined the shirt collar to make it seem more 3-dimensional. 6. Use the green icing to finish the tie. Use thick black icing and a #1.5 tip to pipe two tiny eyes and a big ol' smile. Use thick brown icing and a #1.5 tip to add detail to the hair. Here is a close-up so you can see the food marker details better. And if you want to make him for a wedding, baptism, or the prom...just leave that black name tag off the design and he's ready to party! 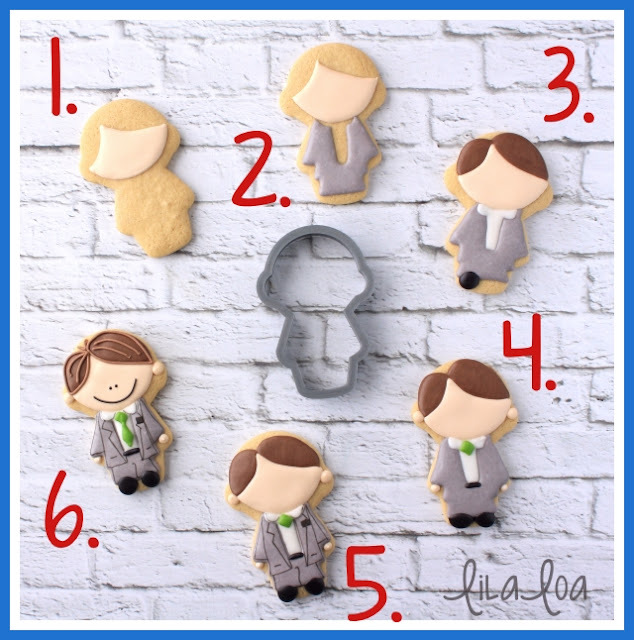 See how I made the shirt-and-tie cookies HERE. Little Man bow tie cookies HERE. 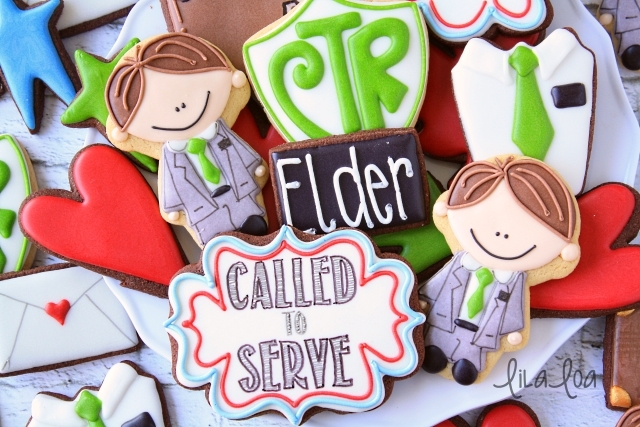 See the tutorial for EASY LDS SISTER MISSIONARY cookies.